Lacey and Zach’s wedding at a private residence had it all—the charm of an afternoon garden party mixed with the romance of an evening spent stargazing. Following an intimate first look, the bride and groom exchanged vows beneath a stunning chuppah comprised of bright blooms and cascading ferns. 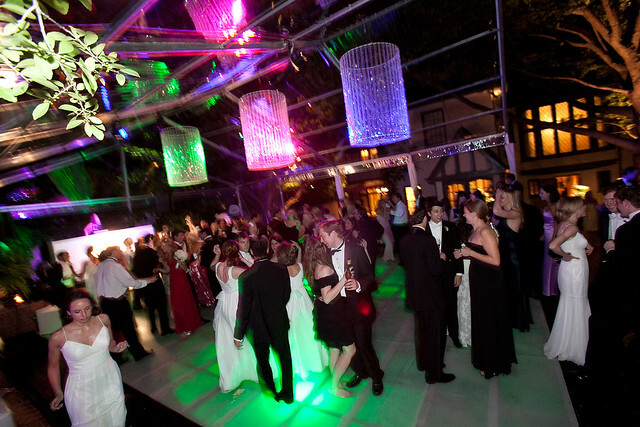 Star panels brought the “wow” factor to the tented reception and gave guests the feeling of dining beneath the stars. Rich linens, mirrored tabletops, candelabras entwined with floral, and a classic black and white dance floor provided the perfect finishing touches. Keep scrolling for more gorgeous details from Sarah Kate! 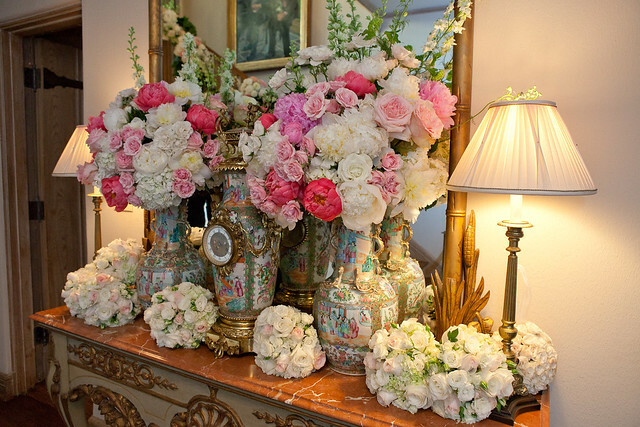 Love the idea of hosting your wedding at home? 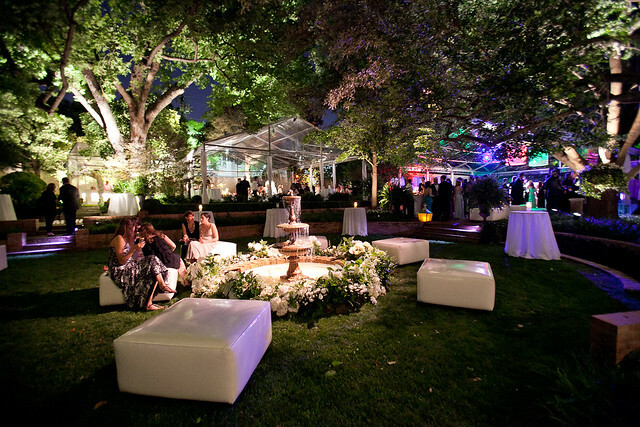 Get inspired by this residential round-up of some of our favorite soirees! Cake: Dallas Affaires Cake Co.
Tiffany describes Dustin’s proposal while on a family vacation in Saint Barth’s as being like “a dream,” so it’s no surprise that the couple’s wedding day was designed to feel just like a fairy tale! 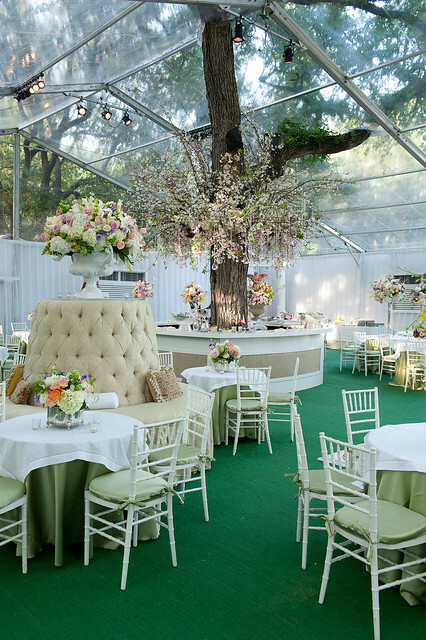 “Junior at Garden Gate made my vision come to reality,” says Tiffany of the enchanting décor, which featured ethereal accents of butterflies, a mix of sheer and sequined table linens, and a color palette of the palest pinks and icy silver hues. 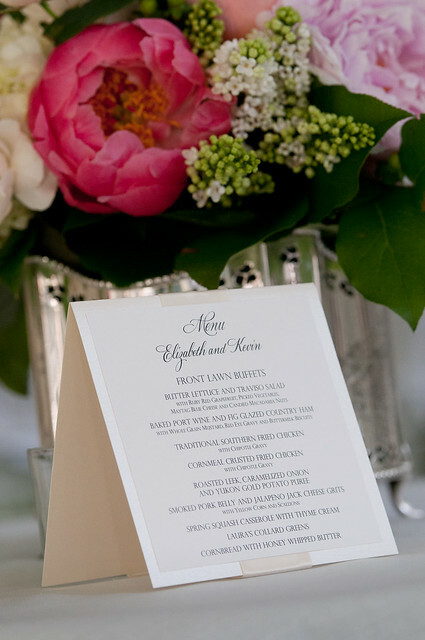 Selecting the Dallas Country Club as their wedding venue was an easy choice for the couple, who had enjoyed grabbing a bite to eat poolside with family members on many previous occasions. Although Tiffany originally had an outdoor affair in mind, rain required that the ceremony be moved indoors. “With several phone calls and the best wedding team a girl could ask for, our ballroom was transformed into a magical ceremony location with candles, flowers, mirrored vases, and bar fronts that were used as props to add ambiance with an amazing string quartet,” Tiffany recalls. The magical mood carried over to the reception entrance, which hosted the couple’s guest sign-in book beneath a breathtaking butterfly tree installation accented by string lighting from Beyond. A bar was the focal point of the opposite end of the room thanks to a stunning ice sculpture by Ice FX embellished with the couple’s custom wedding monogram. Upon entering the reception room, the couple’s 275 guests enjoyed a delicious menu featuring everything from tenderloin to salmon before dancing the night away as Special Edition Band played from the mirrored stage. 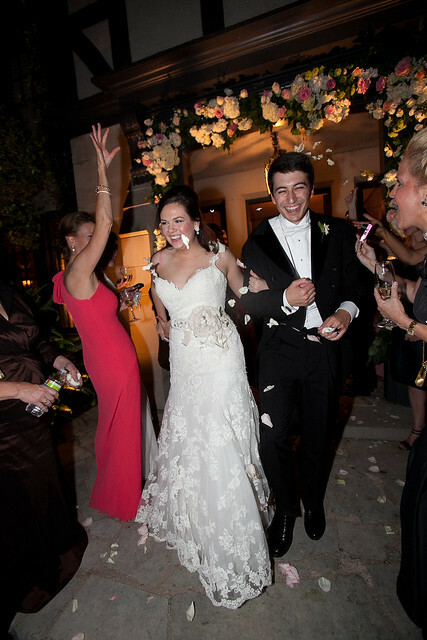 The bride changed from her stunning Ines di Santo wedding gown into glamorous cocktail attire just for the occasion! Congratulations, Tiffany and Dustin! We loved being a part of your dream-come-true day! Cadbury eggs have been on the shelves for weeks, and yet somehow it still feels like a surprise that Easter is already here! 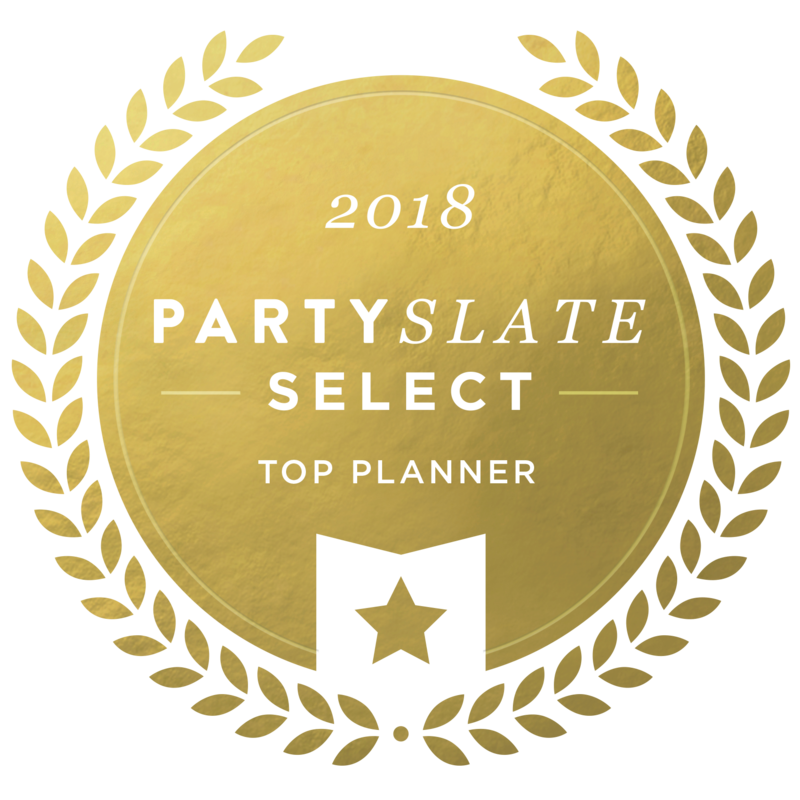 We’re guessing that many of you will be hosting a gathering or two this weekend, but trust us—there’s no need to panic (even if your tablescape is still up in the air and your menu is less than set). Our Director of Event Planning, Alison Baker, just so happens to be a devotee of at-home entertaining, and she’s got all the tips you need to plan an Easter brunch that’s equal parts stylish, stress-free, and perfectly suited to your own unique spin. Put dough in spring form pan and brush with an egg white. Fry bacon and sauté ham if using both. Crumble bacon. Sauté onions and mushrooms in bacon fat or vegetable oil. Beat eggs, add spices, then pour both creams in blender. Layer meat, veggies, and cheese on top of crust. Slowly pour on milk/egg mixture. Bake at 350 degrees for an hour or a little more until puffed and brown. Set on a pizza pan to allow for easy transportation to oven. Allow to sit and firm up for at least 15-20 minutes before cutting. Can be served at room temperature as well. • You can use spinach (10 oz. frozen) that has been cooked with onion then cooled instead of mushrooms, or you can leave out all vegetables, which is a Quiche Lorraine. • This can also be made in a deep-dish pie plate, 2 rectangular tart pans, or a 2-inch deep round tart pan. • If you have made the filling the night before, just set it out to get to room temperature prior to baking. Bring water, sugar, and ginger to a boil in a 2-quart saucepan, then stir until sugar is dissolved. Simmer 10 minutes, stirring occasionally, then remove from heat and let steep 15 minutes. Pour ginger syrup through a sieve into a bowl, discarding ginger. Chill, covered, at least 2 hours. Toss fruit and mint with 1/4 cup syrup, or to taste. Note: Syrup keeps, covered and chilled, for 1 month. Preheat the oven to 350 degrees. Butter and flour a 9-inch round baking pan. Combine the granulated sugar, brown sugar, cinnamon, and nutmeg in a bowl. Stir in the melted butter and then the flour. Mix well and set aside. Cream the butter and sugar in the bowl of an electric mixer fitted with the paddle attachment on high speed for 4 to 5 minutes, until light. Reduce the speed to low and add the eggs 1 at a time, then add the vanilla, lemon zest, and sour cream. In a separate bowl, sift together the flour, baking powder, baking soda, and salt. With the mixer on low speed, add the flour mixture to the batter until just combined. Fold in the blueberries and stir with a spatula to be sure the batter is completely mixed. Spoon the batter into the prepared pan and spread it out with a knife. With your fingers, crumble the topping evenly over the batter. Bake for 40 to 50 minutes, until a cake tester comes out clean. Cool completely and serve sprinkled with confectioners’ sugar. Notes: You can prepare the entire cake (including the streusel) the night before and refrigerate. In the morning, let sit out for 15-20 minutes before baking. With a goal to represent both Rachel and Andrew’s personalities in the wedding colors and environment of the event, Jasper and Prudence created bouquets and aisle accents in a palette of cream and dusty pink—a perfect accent to the natural beauty of the venue. The bride complemented her sparkling Brides by Demetrios gown with two separate pairs of shoes—Hunter boots and pale pink pumps covered in crystals—and her bridesmaids were well-heeled in matching Louboutins. 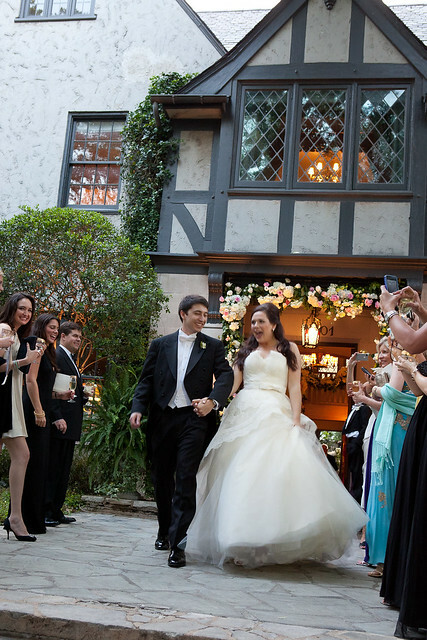 Ever since the Carlock family moved into their historic, Highland Park home, Elizabeth dreamed of having her wedding there someday. 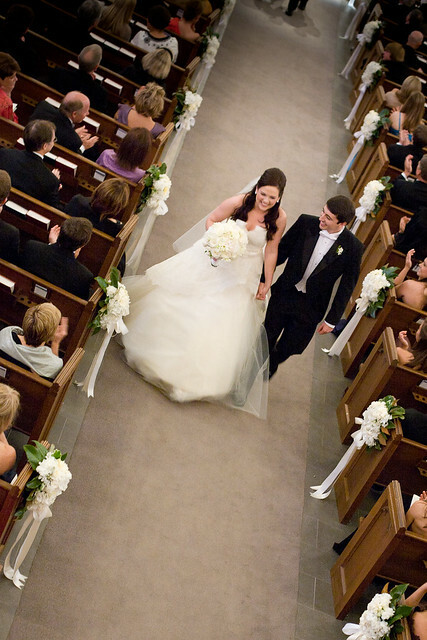 On May 7, 2011, her eighth-grade dream became a reality when she married her college sweetheart. 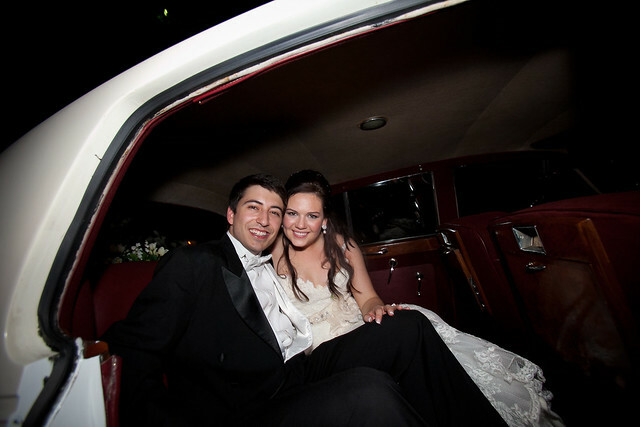 Elizabeth and Kevin met their freshman year at SMU and after a proposal in July 2010, the two started planning their magnificent wedding day. 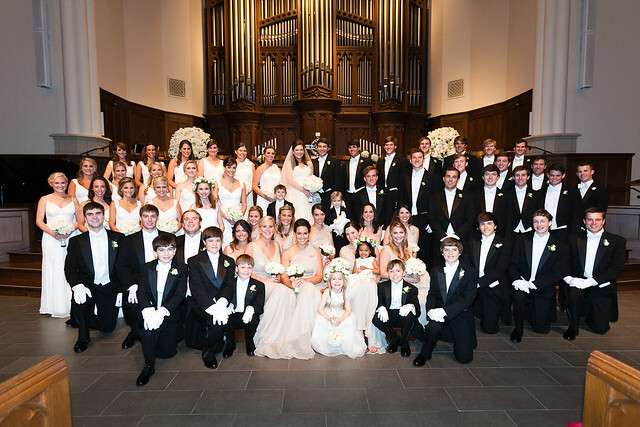 The wedding ceremony was held at Park Cities Presbyterian Church. Immediately following, guests were invited to stroll across the street to the Carlock family home for a wonderful reception. 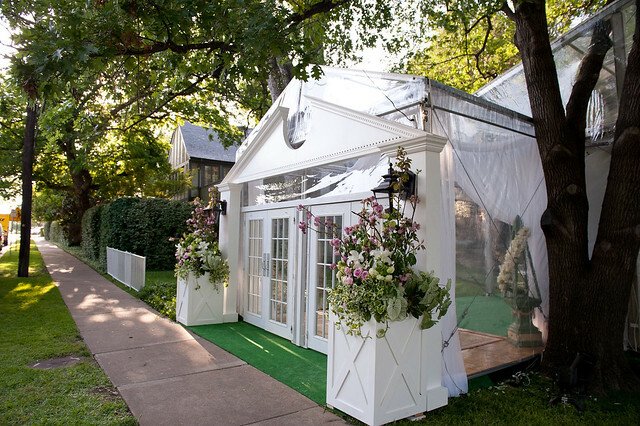 The front yard tent was created to reflect a traditional, southern ballroom, the beautiful home was open to guests and the back yard transformed to a chic, modern party. Thank you Larry Sengbush for sharing these beautiful pictures! Because of the size of their wedding party, and the reception plans, Kevin and Elizabeth decided to see each other prior to the ceremony. 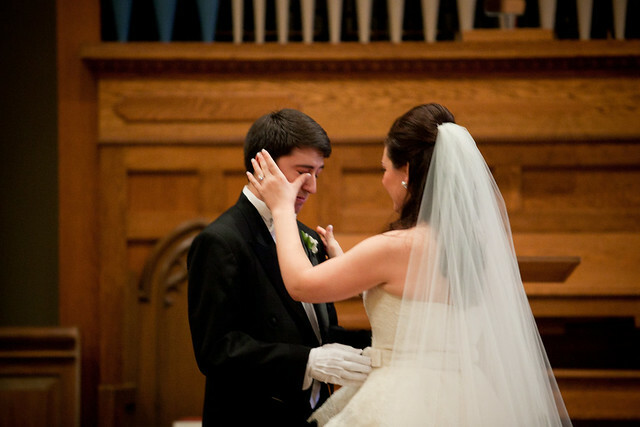 Once ready, Elizabeth joined Kevin in the Chapel at PCPC where they shared a private moment. This is a GREAT idea for brides who would like to eliminate post-ceremony pictures, as we scheduled to finish all photos prior to the wedding ceremony. The gorgeous wedding party! Elizabeth and Kevin were surrounded by so many friends and family that love and support them. To be exact, there were 15 bridesmaids, two junior bridesmaids, 10 house party members, 15 groomsmen, 12 ushers, along with two ring bearers, two flower girls and two officiants. 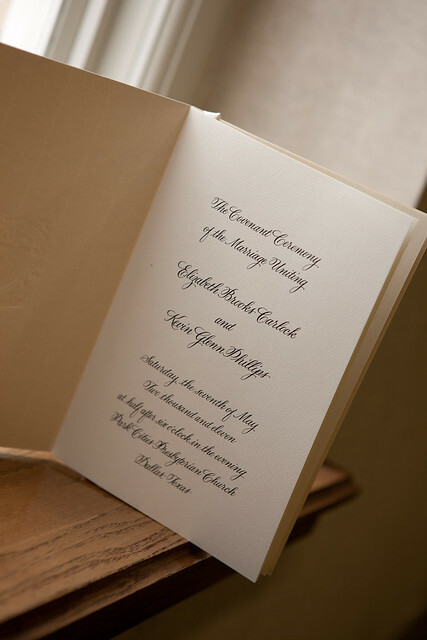 The wedding program…the artwork was created by the fabulous Susie-Melissa Cherry. Kevin and his handsome attendants ready to walk down the aisle…the groom’s party attire came from Culwell & Son. The stunning bridesmaids…both the house party and bridesmaid gowns were custom creations from Jenny Yoo through Bridal Collections by Stella. Every single one of the girls looked absolutely beautiful! 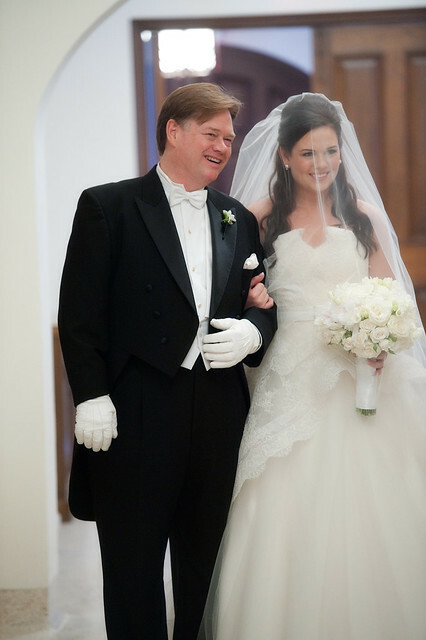 Miss Elizabeth Carlock about to walk down the aisle to become Mrs. Kevin Phillips, escorted by her father, Mr. Byron Carlock. 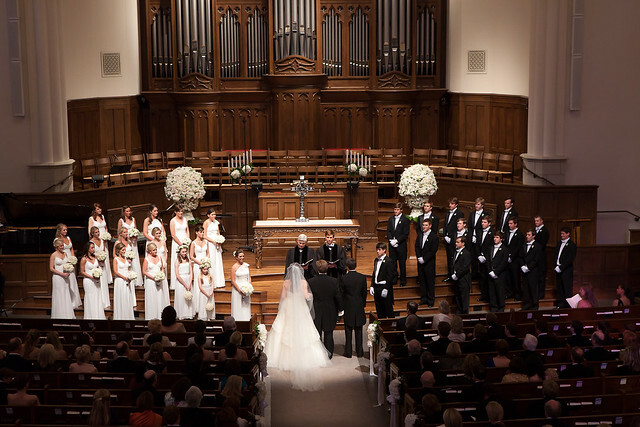 The wedding ceremony…the altar and personal flowers were provided from Bill Horton designs. As guests were seated, the Chancel Choir of PCPC offered a compilation of hymns. During the ceremony, there were two different soloists who sang special songs…between the vocals, the organ and strings, the music was fantastic! The officiants were the Senior Pastor of PCPC, Reverend Mark Davis, as well as, SMU’s RUF director, Chad Scruggs. 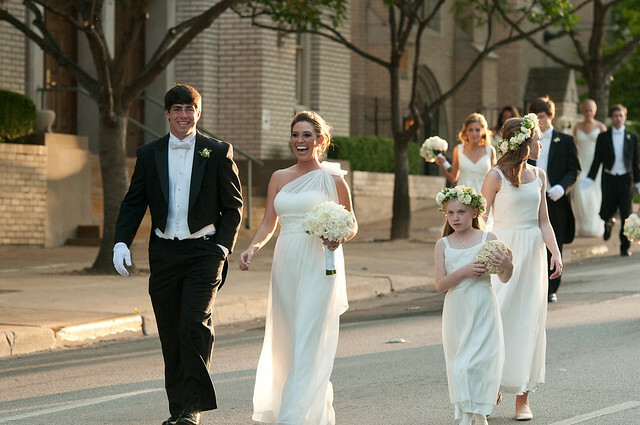 Following the wedding ceremony, the couple led their wedding party and guests down Wycliffe Avenue directly to the Carlock home, adjacent to the church! The Highland Park police department generously directed traffic and closed down this stretch of the rode until all guests were safely in the reception! 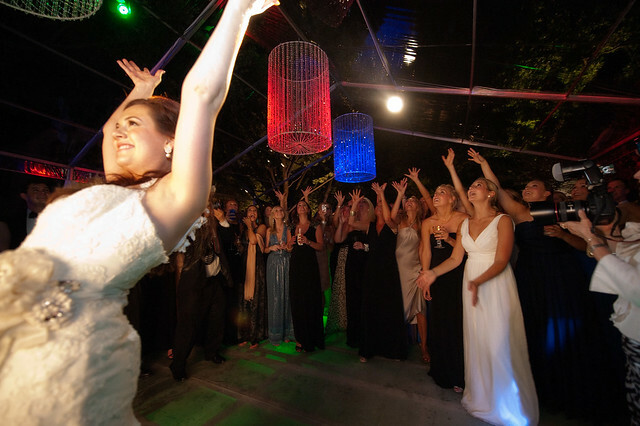 The reception entrance led to the formal, traditional tent in the Carlock’s front yard. Guests were greeted by the James Davis Orchestra and wonderful canapes provided by Cassandra Fine Catering. Elizabeth and her mother, Laura, definitely had a vision for a true, southern wedding. The front tent was exquisite with beautiful linens, floral and buffets displays showing off their lavish menu…Tom Addis, the Garden Gate and Jill Fortney were the perfect team! The father/daughter dance was a sweet surprise to the family and friends…Elizabeth’s talented brothers joined James Davis Orchestra on stage to sing “Brown-Eyed Girl”…so special! 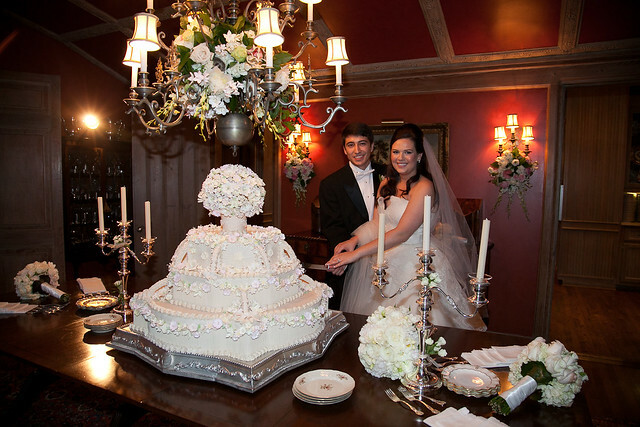 Elizabeth and Kevin cut their cake in the family dining room….Frosted Art created a STUNNING bride’s cake that was absolutely picture perfect! And now for the back tent…. 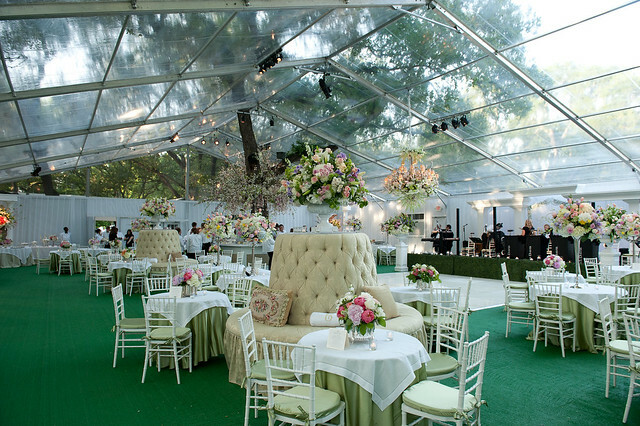 while the front tent definitely eluded to the southern, traditional style, the back tent was more of a modern, sleek look!! 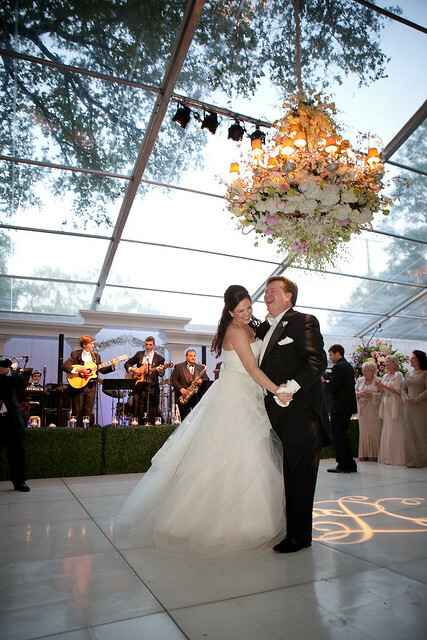 Between the furniture, lighting, tenting and acrylic dance floor that covered the pool… it was incredible! 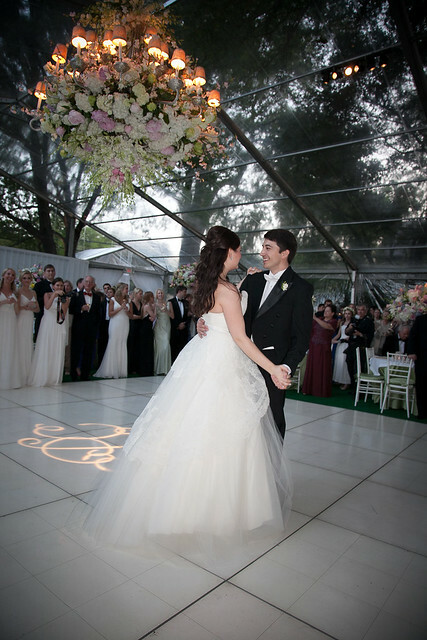 Elizabeth and Kevin were introduced into the back tent, as well….only after Elizabeth changed into her second wedding gown! 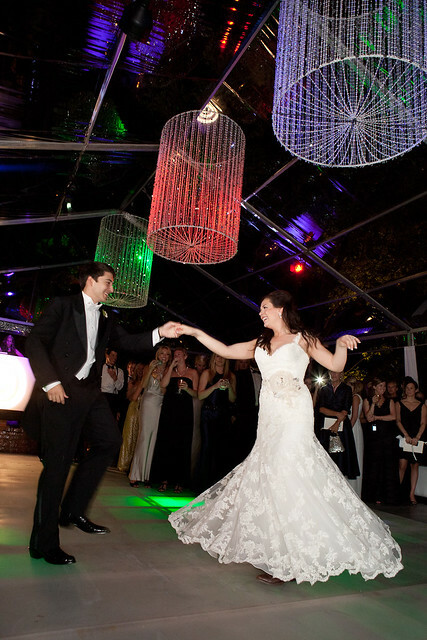 Their second, first dance was spun by the fabulous Lucy Wrubel! Elizabeth and Kevin departed the next morning for a two-week honeymoon in France…. 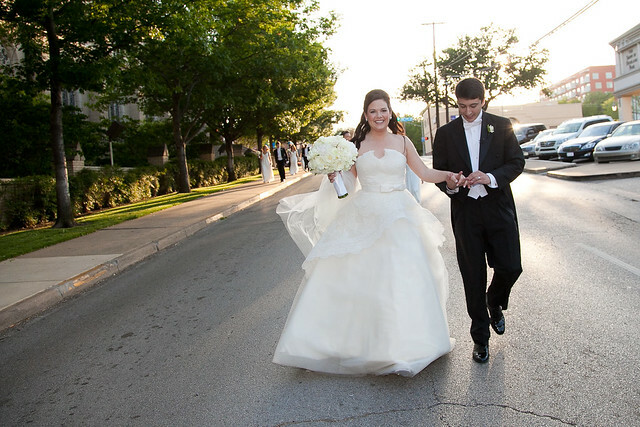 We wish you all the best and THANK YOU for allowing DFW Events to be part of your wedding day! Cheers to the happy couple!